I sat at my desk on a Friday afternoon scrolling mindlessly through my Facebook feed until an ad with a pink perfume bottle caught my eye. Usually I wouldn't click on an add but this day I did, and 5 minutes later I had purchased a ticket to attend on art workshop with an artist for the launch of the new fragrance Arizona. This is the first fragrance made by the fashion brand Proenza Schouler. The concept of the perfume is to allow you to escape the busy world that we live in and take time to reflect and slow down. This is the first fragrance to ever be made with cactus flower extract as I found out only blooms once a year and for one night, which makes sense that it took nearly 6 years to formulate this perfume. Arizona is a feeling of adventure. A place of beauty and mystery. Inspired by the ravines and ridges that male up the desert of Arizona. The bottle is a piece of art, like a teardrop. I entered the workshop which was held at Selfridges on Oxford Street. It was a quiet zone where you had to whisper, there was a mediation class being held, aromatherapy and the art workshop. I got to walk around and look at the displays like virtual reality and try some of the perfume and hair oils. We then entered the workshop which beautifully set up on a semi circle table, with collage materials and a beautful portrait of a girl. Manjit Thapp came out and the class commenced. She explained that we would be making a collage and to colour in the girl anyway we liked. 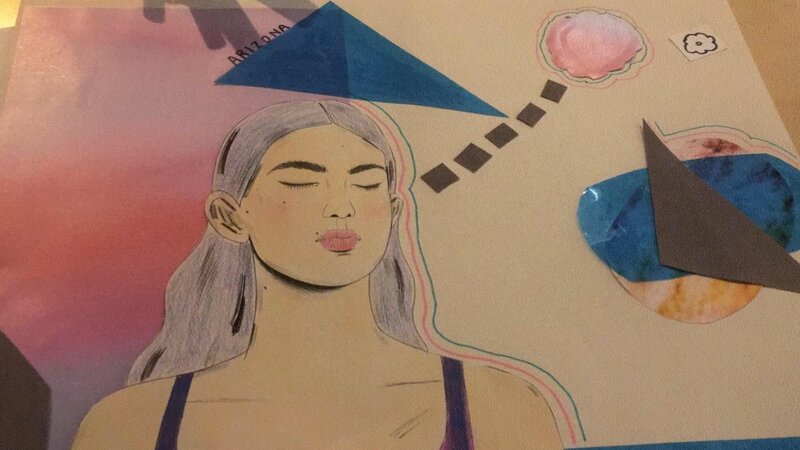 We were added to add shapes and imagery to our collage that make you feel relaxed and give you a sense of mindfulness. I must say I found this class so much fun!! That I went home and was inspired to make some collages myself! After the class finished we could mingle and quietly talk to the artist and each other while another mediation class commenced. Overall this event was very well put together and worth the £5 pounds that I paid which was redeemable with any product that I bought! I'm so glad that I went and got inspired to explore my artistic side a bit more! I honestly learnt from this just to try new things, get yourself out there no matter what and experience the amazing things that your city has to offer! Ps. I just bought tickets for an absolute steal to The Little Festival on the march bank holiday weekend! Can't wait!